In summer, Ledge Route is a 450 metre grade 2 scramble that finishes at the summit of Carn Dearg, a 1221 metre subsidiary top of Ben Nevis. Under snow and ice it is a grade II winter route and reputedly the best of its grade on the mountain. On 10th January this year, three of us headed up the valley of the Allt a Mhuilinn in the grey half light of a wet morning. The imposing massive wall of Carn Dearg rose to our right from the valley floor, its higher crags lost in the pale misty cloud, snow clinging to its flanks on ledges and in gullies, where it could get some purchase. 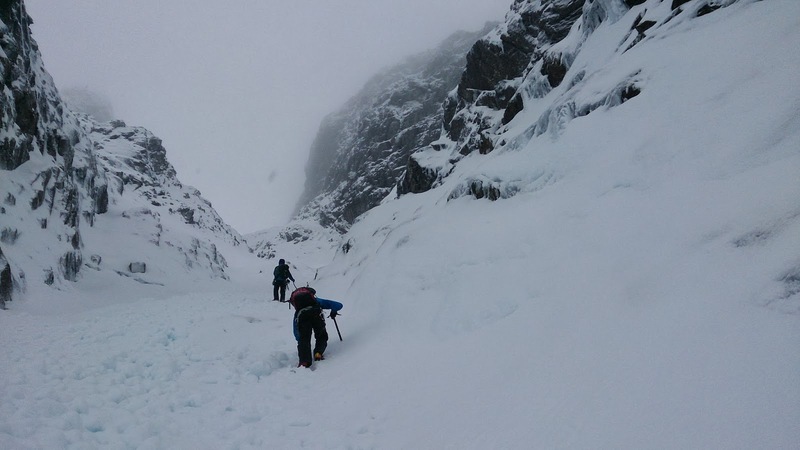 Patches of wet, soft snow slowed our progress as we gradually gained height on our approach to No.5 Gully, the start of our route. There had been a lot of rain in Lochaber since Christmas, and at this altitude it had fallen as snow. This had become unstable in fluctuating temperatures and as we climbed the slope towards the start of No.5 Gully we had to pick our way over and around the previous weeks avalanche debris. This had refrozen to give us a safe, if awkward, passage. 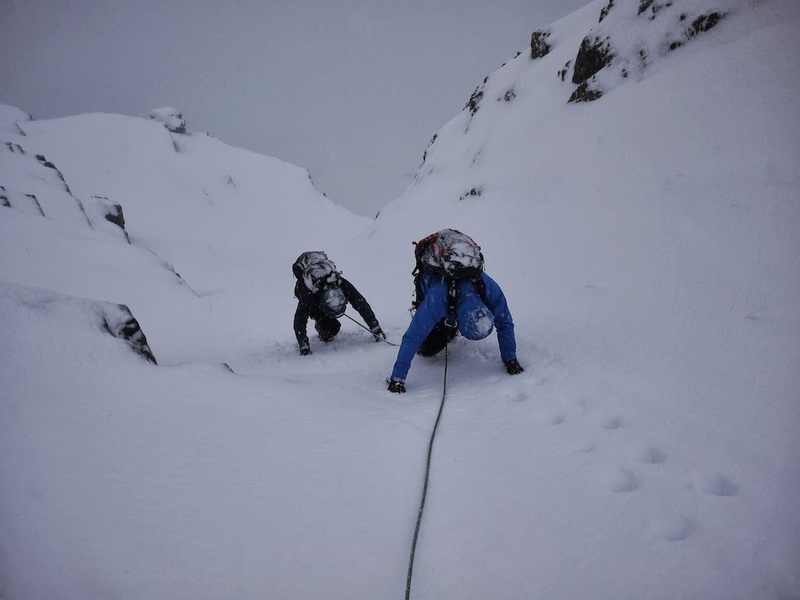 As Rob, the leader of our team, prepared the first belay stance and we put on harnesses and tied in, the snow began to fall anew, large white flakes falling from the pale grey sky. Strong winds were forecast from the southwest, but here on the north face we had reasonable protection, and the snow fell in a moderating breeze. Ledge Route gets its name from a rightward slanting ledge that then sweeps back left to overlook No.5 Gully. Here the route turns right again to join the ridge proper, and leads to some very exposed situations. The ledges and gullies were banked out with fresh deposits of snow lying over older and more consolidated material. 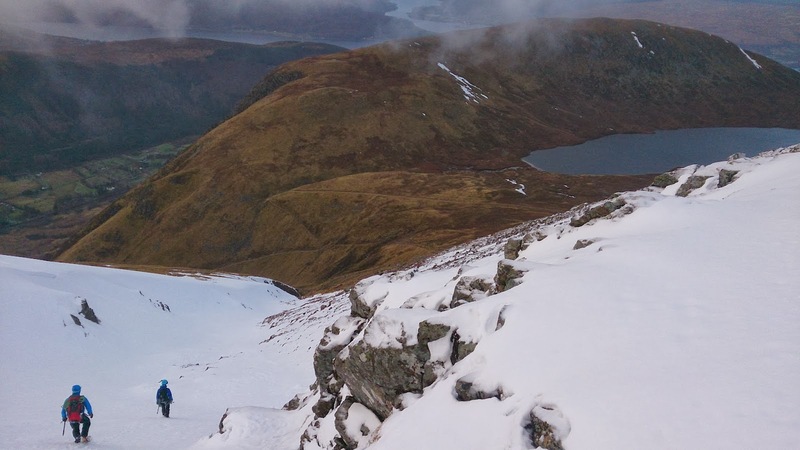 It was decided to pitch this section of the route, and with Rob leading, we plunged our cramponed boots and ice axes deep into the steeply sloping snow to get purchase and made our way carefully up towards the ridge line. Once on the ridge we could move a little more easily, and ‘moving together’, in Alpine fashion, we made steady progress along the sometimes very exposed ridge. 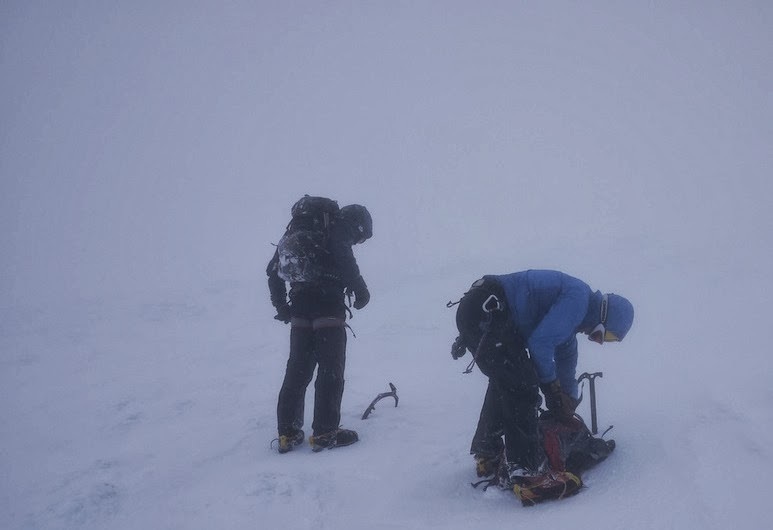 We stopped for a brief lunch on a small platform before continuing towards our goal, Carn Dearg summit. Icy cold strong winds and whiteout conditions greeted us as we topped out making the 2km walk to the summit of Ben Nevis itself an unpleasant option, so we quickly stowed our gear before navigating down the southwest side of the mountain to the Red Burn, a stream that in winter becomes a shallow, snow filled gully. 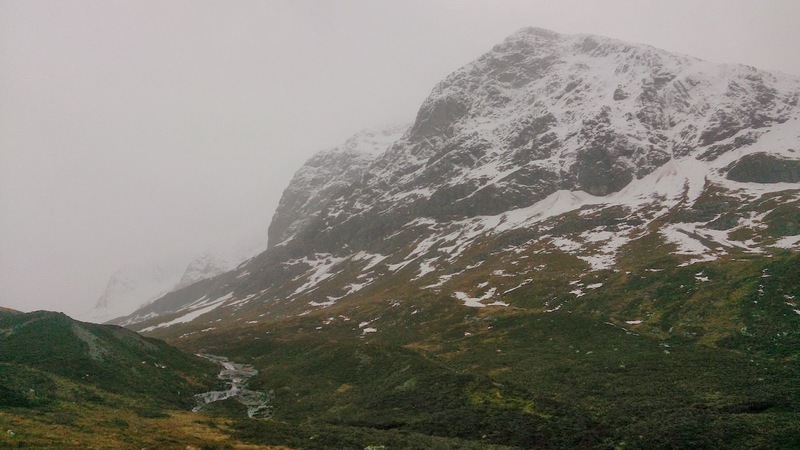 As we walked down and out of the cloud Glen Nevis opened up before us in shades of russet green and brown, the wind eased, and we had the pleasure of seeing several pairs of ptarmigan, an iconic highland bird of the grouse family, in their white coats. They called in alarm at our passing, their distinctive harsh, throaty staccato call filling the cold air. We made our way back, firstly by the path running alongside the Lochan Meall an t-Suidhe, and then over sodden, boggy heath to wade the Altt a Mhuilinn and return to our transport. Our final destination for the day was the Nevis Range cafe, where we indulged ourselves with tea and cake, a fine end to a brilliant day. Thanks and acknowledgement go to Rob Johnson of http://www.expeditionguide.com/ for leading the day and for some of the images, and to Mark Shaw for his good company.